Caring Hearts Pet Therapy program Tales with T.A.I.L.S. (Therapy Animals Increase Literacy Skills) seeks to improve children’s reading and communication skills with the assistance of registered therapy animal teams. 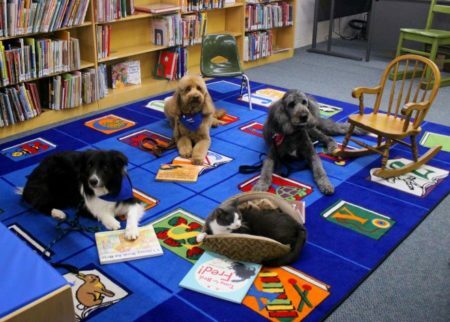 The children are encouraged to read, engage, and connect with the pet. Bring your favorite book or two or choose one here at the library to share with one of our animal friends. Children will have the opportunity to read individually or in small groups with each of the animals at the session depending on the number of children registered and pets available. Animals are attentive listeners and their presence increases a child’s comfort in reading aloud. Recommended for ages K-5th grade. Registration is not required. All team members have completed volunteer training, practice sessions, and have current clearances.